Triple Three is a restaurant on the fifth level of the Mandarin Orchard Hotel. It offers a buffet lunch at $58++ per pax. Currently there is a one-for-one special deal with DBS credit cards whereby one person eats for free. With this offer, the net price is a more palatable $35 per person. We were there on a Monday and were surprised by the sizable lunch crowd that had showed up. The restaurant was bright and decorated in a modern, efficient manner. We felt that the space between tables could have been increased. The waiting staff were courteous and attentive. As in many other buffets, this one had its food laid out by clusters – cold seafood appetisers, Asian dim sum and noodles, western staples such as grilled meats and pasta, Japanese food and dessert. The diversity of dishes was adequate although not as wide as other buffets which we had been to. The Japanese station was the most comprehensive with many sections such as raw food (sashimi and sushi) section, deep fried food, teppanyaki sections. The quality of the food was mostly average – nothing really wrong with any of the items yet at the same time not really appealing to you to go for seconds. 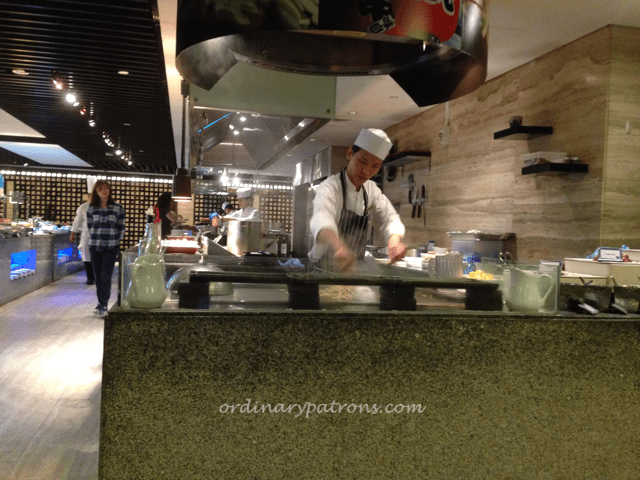 The highlight of the buffet at Triple Three was the Japanese teppanyaki station which you can see in the photograph. Here the chef continuously churns out teppayaki style vegetables (mostly bean sprouts), seafood (mainly squid) and beef. This was clearly the crowd favourite as well as each platter was wiped out as soon as the chef places it on the service counter. Would we return? Maybe, if there continues to be a one-for-one deal and we are very hungry and happen to be in the neighbourhood.